Does Black Toothpaste Really Whiten Teeth? The quest for white teeth has been on my agenda for many years. My teeth have always been a bit of a yellow tone, ever since I can remember really. Even as a teenager before I discovered 3 cups of coffee a day they were a slightly off shade, which always disgruntled me. I know, I’m really alluring right now aren’t I? I’ve tried a few things to boost the whiteness which seem to work in the short term, but what I really fall down on is maintaining the whiteness and brightness of my teeth. Teeth Whitening Strips seem to be the best way to get that initial whiteness and up until now, I’ve found that the Colgate Max White One toothpaste has been the best daily one to keep the glow going. However, as soon as I stop using it, I feel like me teeth go straight back to off-white-ville pretty quickly. When the Curaprox Toothbrush and toothpaste came in to my life, I knew things would be a little different, but as you can see – this theory was all down to the black colour of the actual toothpaste. 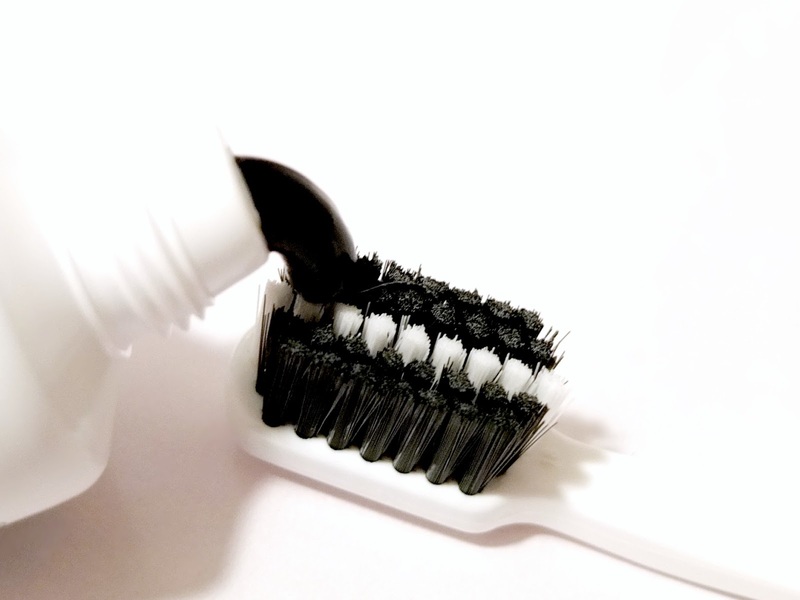 Would black toothpaste really clean my teeth? Would black toothpaste really keep them whiter for longer? The answer? So far, so good. I’ve been using Curaprox daily for around 2 weeks and it seems that this activated carbon toothpaste lives up to the claims. It’s endlessly weird catching a glimpse in the mirror when your mouth is fully of greyish black foam, but as soon as you rinse, you teeth definitely appear much whiter after the first few uses. The taste is very mild, still minty and not gross, but still a definite mild mint. I do find the consistency is slightly more gritty than regular toothpaste, but this isn’t anything to cause concern. You’ll find the formula is quickly something you get used to and to be honest, it’s not all that different than a baking soda based toothpaste in comparison texture wise. How does it work though? Activated Carbon (or charcoal) has been used for years to absorb impurities (this is why when you have stinky wind from your bottom, charcoal tablets from the pharmacist work so well). It absorbs odour and ‘tannins’. Tannins are found in all those teeth staining foods like coffee, wine and curries apparently, and activated carbon attracts these tannins to it and that’s how it whitens your teeth. It attracts the tannins and leaves the enamel. Perfect. 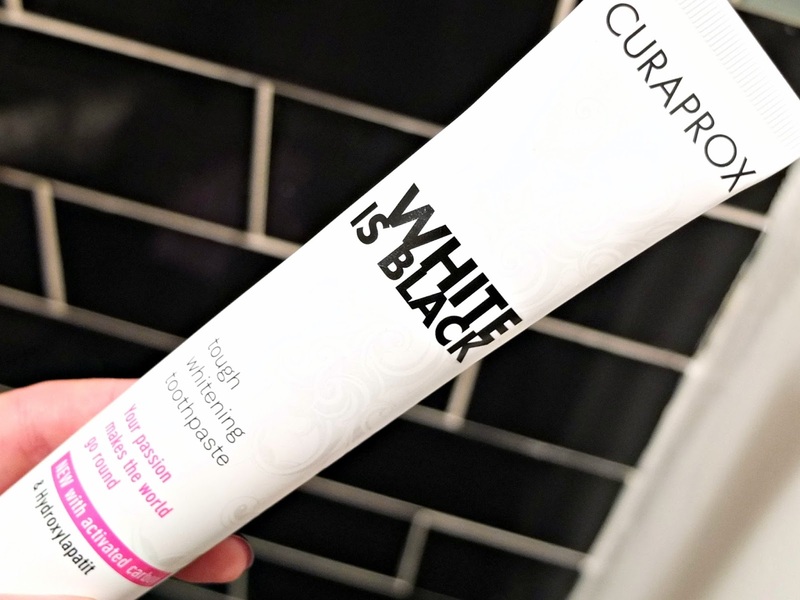 For £20 a tube (which does include a toothbrush) Curaprox White is Black Toothpaste is on the pricier side of the daily teeth whitening ranges, but it works. So worth a try if you’re concerned about the shade of your gnashers.